Kultured is a pop-up bar at 21 Great Windmill Street, Soho, just south of Brewer Street, specialising in fermented and foraged food and drinks, including kombucha, a fermented black or green tea. Set up by Alix Caiger and Jono Hope, it's open Mondays to Saturdays until the end of February, but hopefully longer. Visit! 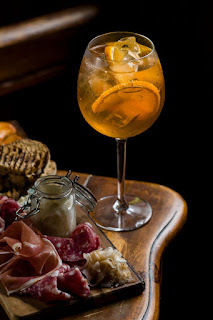 "Soho has a new resident in the form of Kultured, a pop-up bar serving its own naturally carbonated tonics and kombuchas with the best of English spirits, as well a perfectly complementing sharing plates menu of the finest fermented food. Soho’s 21 Great Windmill Street – a former townhouse spanning four floors – will be the place to call home for Kultured. Open Monday-Saturday from 11.30am, the bar will welcome pre-bookings and walk-ins who are open to the introduction of a new way – the Kultured way – of drinking and dining in the Capital. The team behind Kultured are Jono Hope, who launched Bunyardi (London’s first naked restaurant) and Alix Caiger, founder of Caiger & Co. and Salt of the Earth. Jono and Alix have worked together for several years, finding a joint love of all things fermented when they were approached to work on a new café concept early last year."